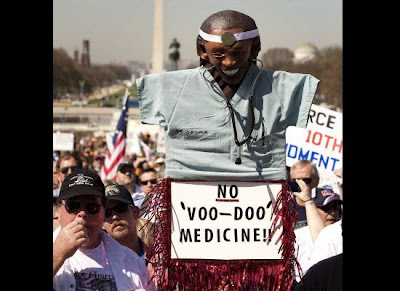 During the final vote on health care reform, the tea partiers gave America a spectacle as they toilet papered the Capitol, verbally and visually. As members of Congress took to the Capitol balconies and the House floor to egg them on, the Republican Party abandoned its claim that the racist hate speech seen and heard was just a few angry folks exercising their freedom of speech by openly endorsing and applauding it. An advantage to unfettered free speech is that people eventually put on display their true motives and character and we find out what and who they really are. The health care debate has been a revelation of an aspect of America that has always existed and has always threatened its true freedoms and protections. In 1935, as the Nazis took over Germany and paralyzed much of Europe, Sinclair Lewis wrote a satirical novel, later produced as a play, titled It Can't Happen Here. It was about how a president with dictatorial ambitions manipulated a gullible populace and seduced them into accepting totalitarian measures by exploiting ignorance and stupidity and venality. The health care debate has given us an It-Can't-Happen-Here moment. The opponents of health care have been manipulated and driven by good old primal hate (a revelation of what GOP has come to stand for). They accuse Obama of being every enemy America has ever had. For many, the ploy is working. Prsident Obama won the primary and the election because he promised to rise above degraded level of partisanship that has characterized political discourse in recent decades. His opponents determined that political retaliation was their platform and denied every attempt at conciliation and cooperation. Their obstinacy and petulance was accompanied by an outpouring of hate propaganda that employed accusations which included racial slurs and charges of being, at once, fascist, Nazi, socialist, and all the bugaboo that could be dredged up from the Ku Klux Klan and McCarthy periods of history. It has not been a time when the best that is thought and said has had much influence on the national discourse. The KKK and McCarthy supporters killed people and destroyed lives. False accusations and hate speech augments violence. Every rhetorician knows that. Violent language is the precursor of violent acts. Congressmen were called racial names as they walked into the Capitol Sunday. One was even spit upon. Those congressmen who gathered on the Capitol balconies, of course, weren't fanning the flames of anger; they were merely promoting those better ideas they have for health care reform. That's why at least ten Democratic congress people reported death threats. Two had their home offices vandalized. Violence driven by political forces can't happen here. Seeing parallels with dark moments of history are, of course, just gratuitous accusations. Unless the one who sees them knows the difference between rhetoric and linguistic war. Primal anger, which boils up from the reptilian cortex, can find outlets other than violence. It can be expressed on the Capitol floor in promises to repeal the health care law. And it can go to court. Fourteen state attorneys general have signed on to take the health care bill to federal court to challenge its Constitutionality. The party-line anger and tactics aside, they do have a point to pursue. Their case will focus on the part of the health care bill that mandates everyone to buy health care insurance. Their position is that this mandate is not sanctioned in the Constitution and, therefore, violates the states rights to do the business to be determined by the states. 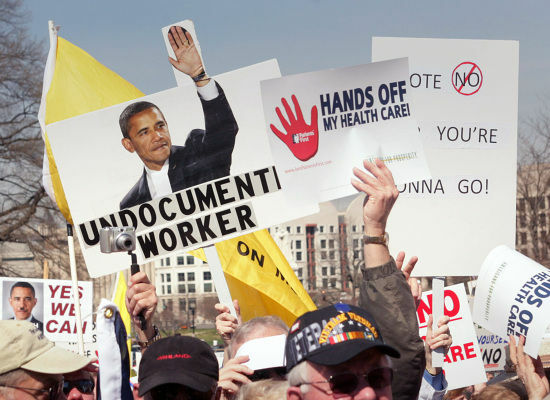 Obama was opposed to an individual mandate, preferring instead strong requirements that employers be required to provide coverage. ``I'm not sure how ready the country is politically to accept the overall mandate,'' Irwin Redlener, a Columbia University physician and advisor to Obama, told The Miami Herald during the campaign. "The truth is this is a Republican idea," said Linda Quick, president of the South Florida Hospital and Healthcare Association. She said she first heard the concept of the "individual mandate" in a Miami speech in the early 1990s by Sen. John McCain, a conservative Republican from Arizona, to counter the "Hillarycare" the Clintons were proposing. McCain did not embrace the concept during his 2008 election campaign, but other leading Republicans did, including Tommy Thompson, secretary of Health and Human Services under President George W. Bush. Seeking to deradicalize the idea during a symposium in Orlando in September 2008, Thompson said, "Just like people are required to have car insurance, they could be required to have health insurance." Among the other Republicans who had embraced the idea was Mitt Romney, who as governor of Massachusetts crafted a huge reform by requiring almost all citizens to have coverage. "Some of my libertarian friends balk at what looks like an individual mandate," Romney wrote in The Wall Street Journal in 2006. "But remember, someone has to pay for the health care that must, by law, be provided: Either the individual pays or the taxpayers pay. A free ride on government is not libertarian." Romney was referring to the federal law that requires everyone to be treated in emergency rooms, regardless of their ability to pay. Dorschner points out that the idea was originated by a conservative economist during the 1980s and was embraced and advocated by groups of business executives and health care organizations. This background and the behavior of the Republicans suggest strongly that the hatred being fanned is not merely opposition to the health care bill. The racist and hateful rhetoric speaks of deeper, primal angers that do not emanate from the rational and moral part of the cortex. The courts are a better place to exercise those angers. But I would not bet they will be confined to that venue. There is a liberal and you-know-what in the White House. And an impassioned factions want their country back. Their country was populated by men in white sheets and hunters of communist witches. Of course, a replaying of the Spanish Civil War can't happen here. What happens if health care reform fails? The question is whether people should have the opportunity to receive health care. The answer from the right is no. Except for those who can afford it. The rest had better get over it and learn to be content with sickness, injury, and death as their lot. In our current political scheme of things, they don't count. The current proposed legislation leaves out 17 million people who don't have health care insurance, so they have nothing to get over, except any illness they have, and the preferred resolution to their problem is death. * 513,000 SD residents will have improved coverage. * 217,000 families and 23,100 small businesses will receive tax credits and other assistance. * It closes the "donut hole" for prescription drug coverage and improves Medicare for 133,000 beneficiaries. * Provides coverage to 45,000 uninsured SD residents. * Allows 67,000 young adults to obtain coverage on their parent's plan. The Cretin Chorus--that aggregation of those who recite Republican cant on blogs--chants we can't afford health care and we have a better idea. The better idea has never been expressed in specific terms. In general terms, the idea is to let market forces bring down the cost of health care and, therefore, make it available to more people. While decrying the ponderousness and inefficiencies of big government, they trust the very market forces that brought the country to its knees through the greed, dishonesty, and incompetence that has caused the Great Recession. These forces, they claim, will take care of the people who can't afford health care, are losing it because they have lost their jobs, who have pre-existing conditions or have exceeded their cost limits, or who must drop it because the premiums have gone beyond their ability to pay. Cogency is not an element of the current political debate. The Republicans insist that the current bill constructed by the Democrats be discarded and the whole process started anew. 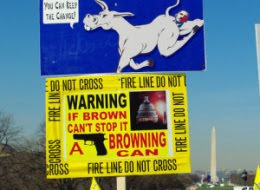 After spending more than a year of work on a very complex problem, the Democrats are expected to, in effect, proclaim that they are too mentally incompetent and morally corrupt to correctly assess the problems and formulate reasonable solutions. The Republicans insist that the poor wretches cry "uncle" and sign over all functions of government to them. Even the most depraved, demoralized cretin would not wallow in such self-debasement, but the Republicans insist on it as the way to address health care. As with cogency, reasonable respect is not a part of the current political debate. What is notable about the debate is that in defining the opposing party and its adherents, the Republicans have defined themselves. They have declared outright verbal war against people with health care concerns. They have defined themselves as the enemy. The opposition to health care reform steadfastly refuses to address the problem of those who, for the many reasons alluded to above, do not have health care. And the media has been digging up instances of people who have died for the lack of it. To someone who actually thinks that human life has value--not merely says it has as a rhetorical flourish of the moment--the refusal to front the problem of those who suffer and die because they do not have financial access to health care is incomprehensible. But incomprehensibility characterizes the debate on the issue. Relevancy and cogency is not part of the current political debate. To people who have been educated in rhetoric in its original meaning--the accurate and principled use of language to create, verify, and refine knowledge--as opposed to its popular meaning--the misuse of language to mislead, misinform, and inflame--what appears to be the official mode of Republican discourse is rooted in solecism, imperscuity, and malice. It is not rhetoric in the pure sense of the term. In more familiar terms, solecism and imperscuity boil down to falsehoods, intentional and gross negligence. There is a more dismaying aspect to the health care debate. The hostility directed toward that 46 million who do not have health care provisions resonates with the attitude of Germany in the 1930s and those who Hitler called the useless eaters. The dismissal of the human value of these millions is couched in terms about the evils of the welfare state. For people who have studied the propaganda and attitudes of Germans in the 1930s, there are some alarming similarities to America's current political debate. As one who served in Germany during the early years of the Cold War, I was puzzled by how the German people accepted the rule and values of the Third Reich. The troops serving at that time were given an indoctrination into the techniques of propaganda and the cultural attitudes that accepted it and led to the rule of the Nazis. Part of our job was to be on the watch for any resurgence of those attitudes. They were there, but at the same time a Marxist-inspired movement was considered more dangerous in the area where I served--the beginnings of the Red Army which developed into a terrorist threat by the 1970s. A correspondent of the Beacon, however, has reminded me of how the propaganda techniques of the Nazi party appear to be the model for some current political movements in America. Ann comes from a military family that was stationed in Germany. She went to a military high school there, was in a program for the gifted, and speaks German like a native. (She is also extremely competent in other European languages.) While in high school, she, too, was puzzled about why the German people accepted Nazi rule, and she discussed and probed her puzzlement with her German contemporaries. She found that Kristal Nacht (the military-led trashing of synagogues and mass-assaults against Jews on November 9, 1938) was the signal event in comprehending how Naziism gained such a hold on the populace. The German teen-agers of Ann's time were resentful and concerned about being held responsible for the history of their country during World War II. They were able to supply Ann with information and perspectives that explained some of Hitler's success in rising to power. When Ann returned to the states, she received a scholarship at a prestigious liberal arts college which required a baccalaureate thesis from its graduates. For her thesis, Ann collaborated with some other students who went to Germany and made a more comprehensive analysis of how the country fell under Hitler's spell and the significance of Kristal Nacht. She recently took a look at the thesis and told me of some its more salient points. After World War I, the German people felt humiliated and angered by their defeat. Hitler's appeal to national and ethnic pride filled a need to regain stature on the world stage, but he also appealed to a sense of Teutonic superiority. Criticism of Nazi policies was denounced as unpatriotic and expressive of a hatred for Germany. Criticism was quickly quelled through this tactic. The Nazis said that anyone who was not able to actively work and support the development of the new Germany was part of a welfare state that impeded and obstructed Germany's return to national eminence. Hence, the condemning term "useless eaters." Hitler made the Jews and other minorities the scapegoats for all the ills that beset Germany. They needed to be eliminated if Germany was to regain the pride and power it once had. At his Nuremberg trial, the commander of Auschwitz, who proudly cited the two-and-a-half million he killed in gas ovens and the half million he killed with starvation and disease, said, "It was something already taken for granted that the Jews were to blame for everything." The intellectual environment of Germany was subsumed by hate-rhetoric that defamed individuals and groups. Ann also reminds that Germany was not the only hotbed of fascism during the 1930s. Mussolini led a fascist takeover of Italy. And the Spanish Civil War, which was a fight between republicans and fascists, saw the fascists win. The energy that put those fascist regimes in power was plain, old grassroots hate and the desire to screw over the less advantaged. While many castigate Congress for the obstruction and rhetoric that holds it in a state of siege, the motive and courage to espouse the fascist dismissal of the needy comes from the down-home folks who emulate their counterparts in 1930s Germany, Italy, and Spain. The right wing pursues belligerent militarism as the only prideful posture that represents America. It feels that any admission of mistakes or wrong decisions is an admission of inferiority that damages national pride. Some people on the right feel that any criticism of the U.S. or any mention of its failings and mistakes is unpatriotic and anti-American. A frequent response to stimulus efforts, unemployment relief, and health care reform is that they are part of the "welfare state" through which government takes money away from those who work to give to those who don't. The "useless eaters" complaint is alive and well in the U.S.
Liberalism is branded as the great culprit behind all of America's problems. ("It is already taken for granted that the liberals are to blame for everything.") Spearheaded by Joseph Goebbels' most dedicated student, Rush Limbaugh, the right wing has assigned liberals the blame for every human transgression from homosexual pedophilia to flatulence. Liberals just don't understand the extent of their power and influence. The de rigueur mode of Republican rhetoric is never to do a fact-based point-by-point analysis of anything you oppose. Rather always, Always, ALWAYs concoct an accusation of intellectual or moral defect or depravity against some person or group. This tactic does not require any knowledge or honesty, but works up a good case of hatred for any ultimate solutions for the vanquishing of the left wing. As the propaganda analysts of the Holocaust have pointed out, the foundations of gas ovens are always built with defamatory words. This is the strategy in use to defeat health care. The Republican mode of discourse avoids studied critiques of the policies being advanced. Instead, it focuses on defamation of persons and accusations that have no substantial basis. A look at the blogs originating in South Dakota provides compelling evidence that the rule of right wing discourse is character assassination. said that the passage of health care reform would lead to civil war. They did not consider what reaction would be produced by the millions of people who have been, in effect, termed useless eaters and negligible entities. As someone who taught at a denominational college for a time, I have many colleagues who are pastors and professors of theology. They say that the message of Christ is clear and unequivocal: clothe and shelter the poor, feed the hungry, and heal the sick. That message is a volatile irritant to the right wing these days. Millions and millions of Americans have been informed by the obstructionists in Congress and their rabid supporters outside that they do not have a country. The choice seems to be between reform or revolution.